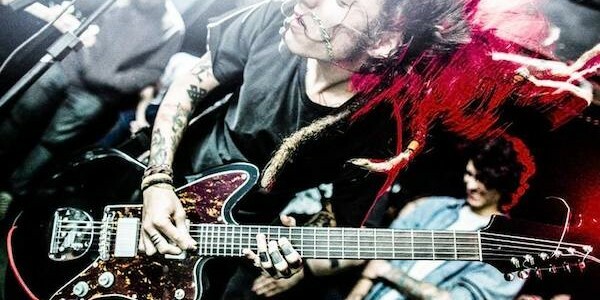 In our latest band spotlight, we chat to Brazilian doom merchants, DEAFKIDS. Talk us through your main inspirations as a band, outside of music, think about movies and games for example? Outside of music I can think about some names that inspired us with their works, such as Eduardo Galeano, C.G Jung, Robert Anton Wilson, H.D Thoreau, Timothy Leary, Alan Moore, The Black Panthers, Glauber Rocha, Cangaço and Alejandro Jodorowsky. Besides that, psychedelic experiences and the eternal search for evolution and a better knowledge and conection with ourselves and our environment, relationships, history, the third-world realities, problems and struggles. Also, being Brazilian and the process of dismantling our roots of evil can be some of our main inspirations as a band. What would you say the biggest challenges you are facing right now as a band are? Maybe the biggest challenges we have in front of us right now is expanding even more our possibilites by using the doors wich are being opened to us, from concerts and tours to the music we create itself. We have our limitations when it comes to the access of good equipments and things like that, for example. To move on while refreshing and being connected to the fundamental spirit which has brought us together to make all of what we do as a band. The idea is not to think with obstacles, but with solutions. What does the opportunity to support Neurosis mean to you? It means a lot! First of all it means the opportunity of meeting really nice people who opt to remain creative and doing their thing for 30 years – it means getting to know them and seeing that they are simple, honest, inspiring and lovely down-to-earth people who just do what they love. Finally, it meant creating and celebrating bonds wich we hope to keep for our lives! How nice it is to watch and work on this history unfolding – from the first contact and Steve’s interest to the almost-one-year after, when we finally met and shared the stage together… it’s just the beginning and it’s pure magic! Talk to us about how you normally write songs, where do you write, and is it a process you do together as a band? Generally I have a lot of crazy ideas in my head, and we usually write everything back on our rehearsal space (which is our living room), focusing on a specific rhythm or crazy beat and then we develop the ‘trance’ from there. What are your plans as we head into 2018? 2017 has been a very special year for us, and to be honest, looks like things are just starting! For next year we’re planning some tours around Europe and US, and some gigs across Brazil and maybe South America. Also we have plans to record some new stuff, so for sure it will be a great year! Friends from all over the globe, invite us to play.